I went high tech this time, and let Random.org pick my winner. 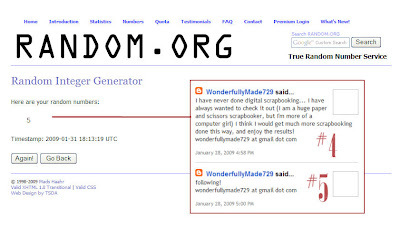 The winning comment was #5 by WonderfullyMade729, who is following my blog (thank you so much!). And based on her comments, I’m sure she will make great use of her prize! I’d love to see some of your layouts, Wonderful, after you get going. For the rest of you, don’t forget that Tutor Me Girl is offering a special discount to My Insanity readers. You can get the same starter kit package for $29.95 instead of $39.95, by paying here for the next couple of weeks! Thanks to Bonnie, at Tutor Me Girl for her generous giveaway! And thanks to everyone who entered!